Milan, Italy, second quarter of 15th cent. Purchased by J. Pierpont Morgan (1837-1913), 1912. Purchased by J. Pierpont Morgan (1837-1913) from Vladimir G. Simkhovitch in 1912; J.P. Morgan (1867-1943). Ms. single leaf, perhaps from a psalter; written and illuminated in Milan, Italy, in the second quarter of the 15th century. Musical notation: on verso, 4-line stave in red ink, with square notes. 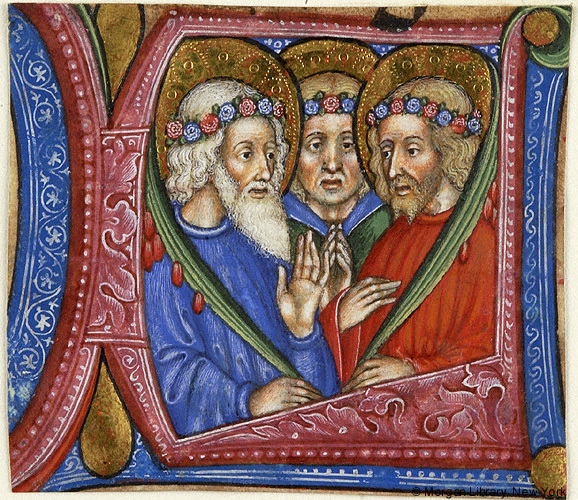 Decoration: 1 historiated initial with three martyrs. Artist: Girolamo da Milano, the Olivetan Master. Matted with Pierpont Morgan Library. MS M.558.2.